RSRSNES is a DOS based emulator that began in early 1997, and was discontinued sometime in 1998, written by Grog. There were two releases, 0.10 and 0.20, of which only 0.20 still remains on the internet. RSR stands for "Realtime Simulations and Rollplaying Games INC.". The developer seems to have wanted to create his own rpg for the snes. The emulator is open source, and written in ASM. The 0.20 version requires the program dos32.exe to run. The emulator had limited success, and only runs the homebrew "sonic.smc". 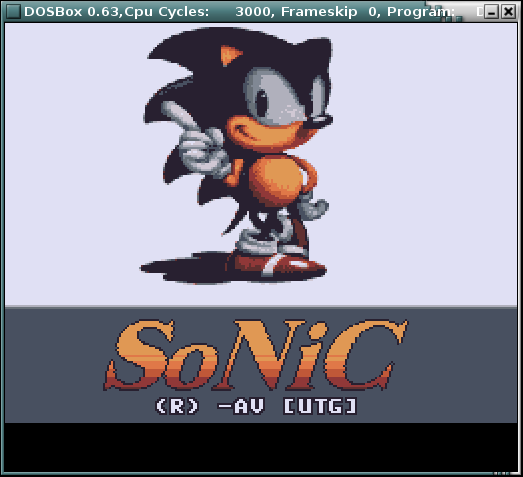 Running sonic.smc is hardcoded into the emulator, so you would have to recompile with a different filename to run a different rom. It met its official end on August 23, 1998. The homepage of the emulator can be found here, which includes some additional screenshots from the 0.10 version. Another related project to RSRSNES is SNIDE, which stands for "SNes Integrated Development Environment". This project was to be a complete snes development kit, including compiliers, tile editors, conversion of sound files to SPC format, among other things. The core of SNIDE was to use the RSRSNES emulator. However, no releases of SNIDE ever made it out. The final word on the RSR was a page that featured some basic snes tools in the Snes Developer's Lobby. It features some simple snes demos, including a snes tile editor. It is unknown what happened to RSR, but it is likely the author became disinterested and left the scene. Download RSRSNES here. 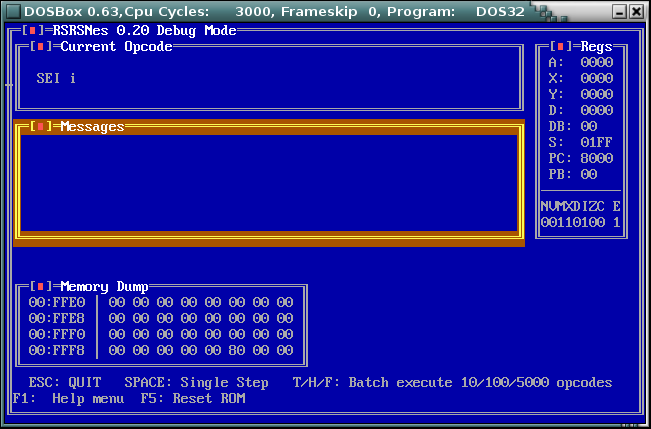 Note that the "D" executable is the debugger, and the "v" is the display.